15th October 2018 at the Barbican, London EC2. Country: Ireland. Style: Traditional Irish Folk. Lineup: Andy Irvine (v/mandolin/mandola/bouzouki/g/harmonica/hurdy gurdy), Paul Brady (v/g/mandolin/bouzouki/keyboard/whistle), DÃ³nal Lunny (bouzouki/g/keyboard/bod), Kevin Burke (fiddle). This concert reunited the four musicians who played on the "Andy Irvine / Paul Bradyâ€� album of 1976. After Planxty broke up in in November 1975 two of its members Irvine and Brady performed as a duo for two years. They reunited for a one off concert in Glasgow in 2008, a tour of Ireland in 2017 and this tour a year later with gigs in Ireland, London and Prague, The Barbican is also the place where I saw the reformed classic lineup of Planxty in 2005. The second half of the concert consisted of songs and tunes from the album (including "Arthur McBride" and "The Lakes of Pontchartrain"). 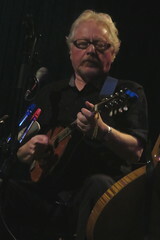 The first apart from some tunes chosen by Kevin Burke alternated songs from Irvine ("O'Donoghues", "BÄƒneasÄƒ's Green Glade", "The Blacksmith") and Brady (several tradtional songs from Northern Ireland learned from singers like Eddie Butcher). I have photographed Irvine, Lunny and Burke before either solo and with other groups (to view click on the musician's name in My Tags). All times are GMT -5. The time now is 3:35am.